I have always missed those Christmases past when I was so excited to wake up on Christmas morning in my own house and couldn't wait to see what Santa had laid beneath my tree and put into my stocking. 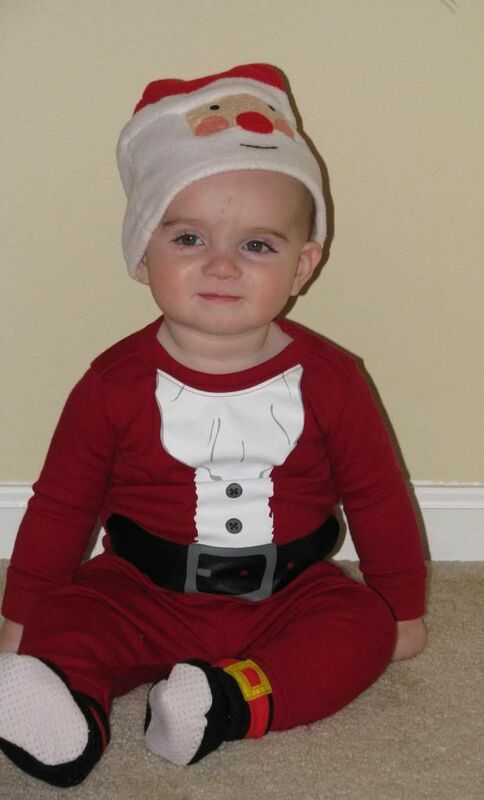 Somehow, even after I "logically" knew who the real Santa was, it still felt magical. Maybe it was just the joy of being together as a family with the warm glow of the Christmas tree shining in the background. 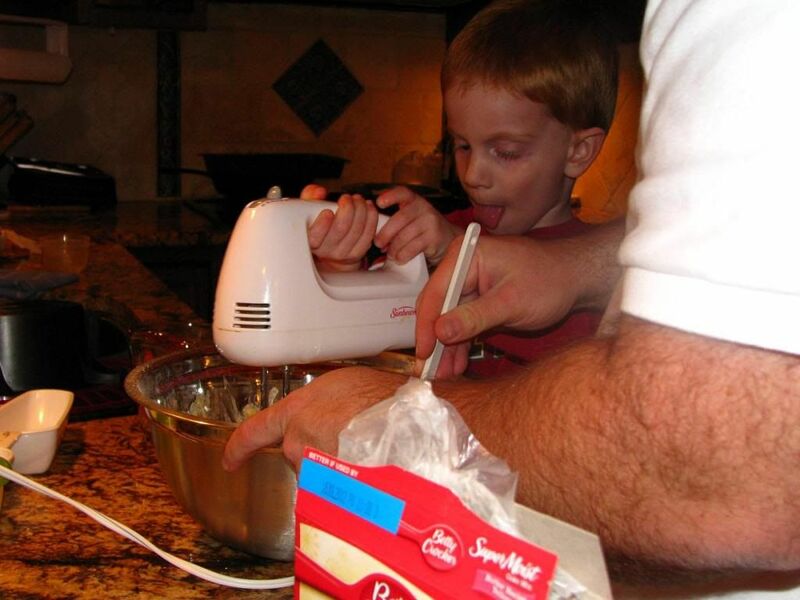 Whatever the reason, I have always wanted to give my children this same experience. We have always planned our Christmas around being at home on Christmas Eve and Christmas morning for this reason and plan to continue to do so. 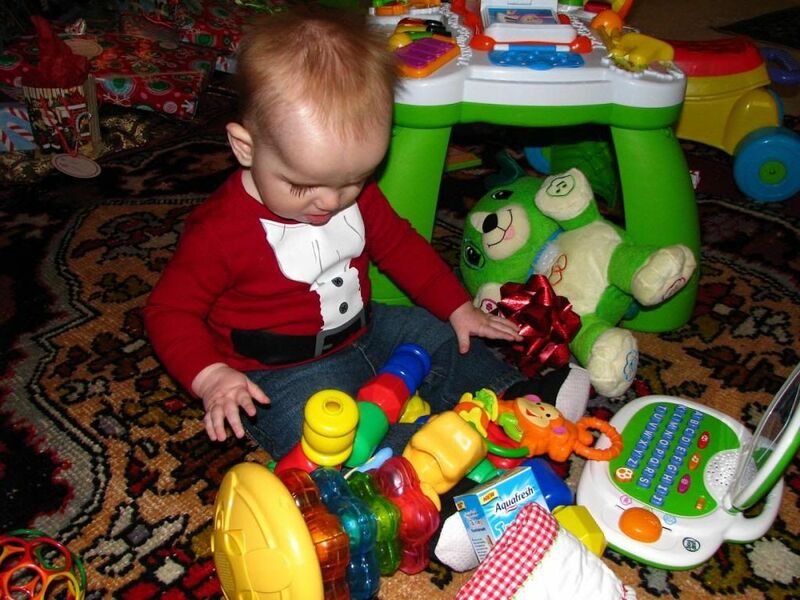 Christmas 2011 was truly a joyful time in our home as we celebrated our first Christmas with Brody. 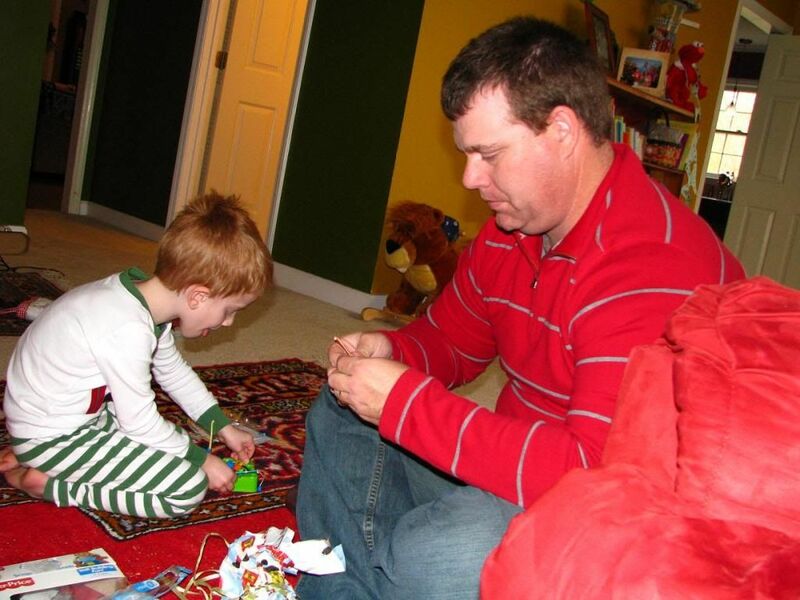 I think Evan really appreciated having a little brother to share Christmas morning with. 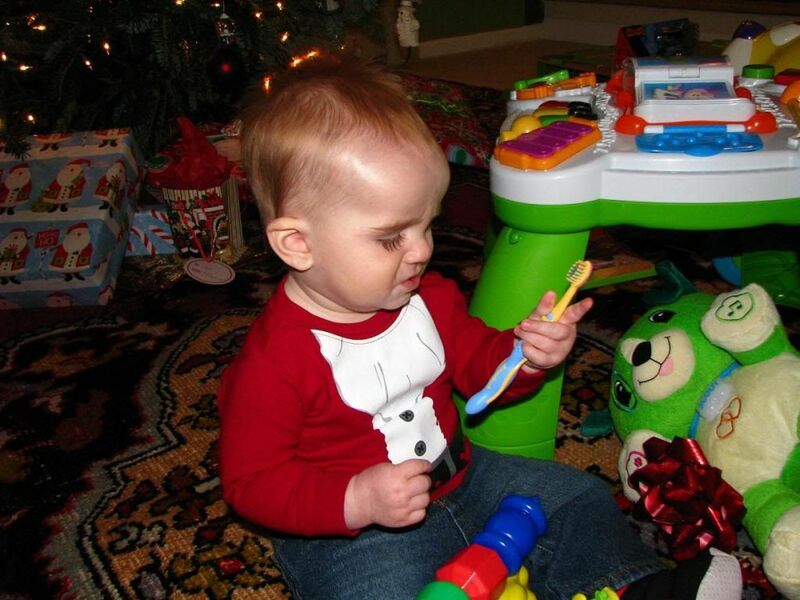 The first thing Evan said when he woke up on Christmas morning (still unaware that it was actually Christmas Day!) was the same thing he has been saying every morning for the last few weeks. He has been really into our new tradition involving the Elf on the Shelf and loves to go and find "Brewster" in the mornings. Mommy had been a little worried that he would miss "Brewster" when he was gone because the Elf is supposed to leave on Christmas Eve night after Santa comes to visit only to return the next Christmas. 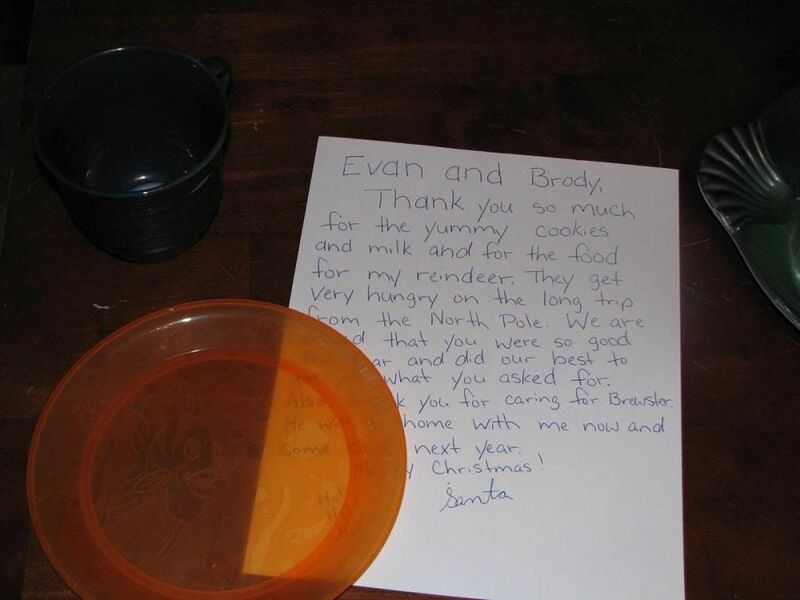 Luckily, "Santa" had left a little note downstairs beside his cookie plate that explained how Brewster had departed with him and would see the boys again next Christmas. That did seem to help. We all gathered in Mommy and Daddy's bedroom before going downstairs together although Evan had peeked over the gate on the stairs and tried to see what was under the tree for him. 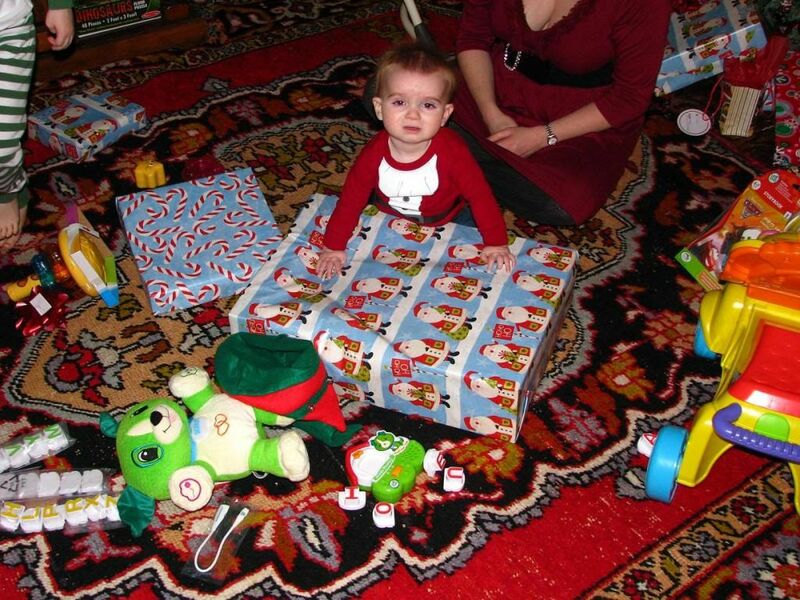 Luckily his big present was out of sight in the Den with the television. 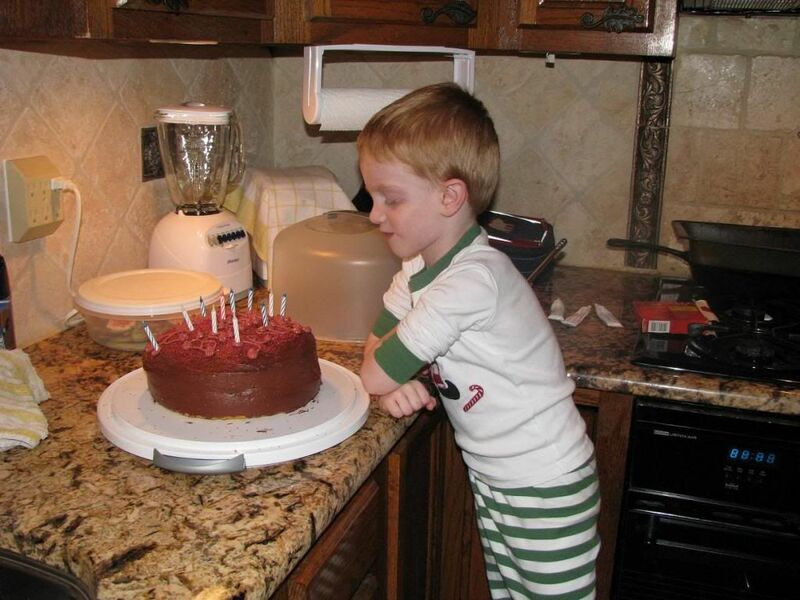 Christmas began on Christmas Eve when we returned home from Nana and Papa's, and Daddy and Evan made a birthday cake for Jesus. 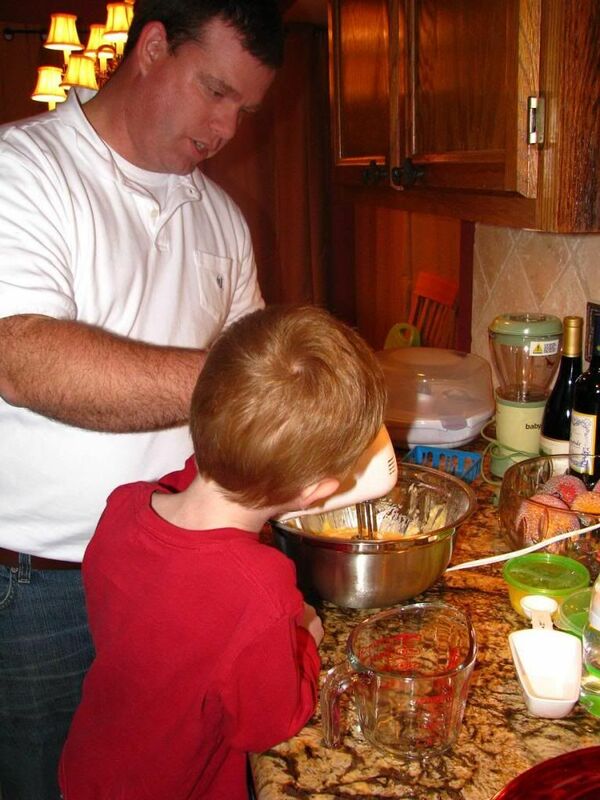 Evan loves to help in the kitchen. 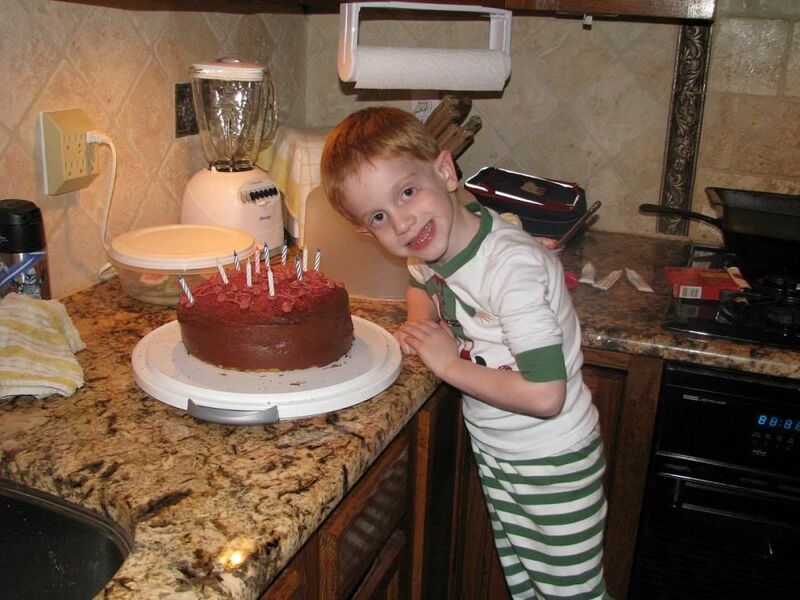 Evan poses with the finished cake after helping Mommy decorate it and add birthday candles. 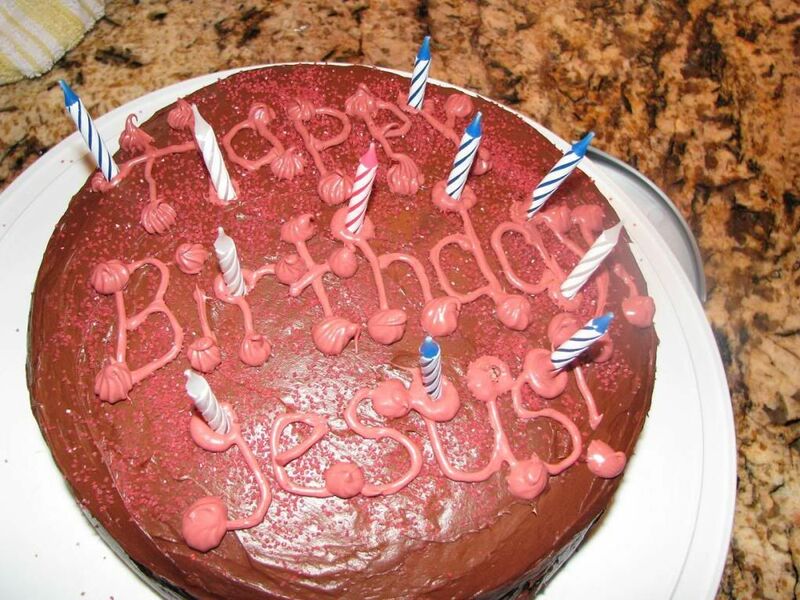 We hope Jesus liked his special cake! 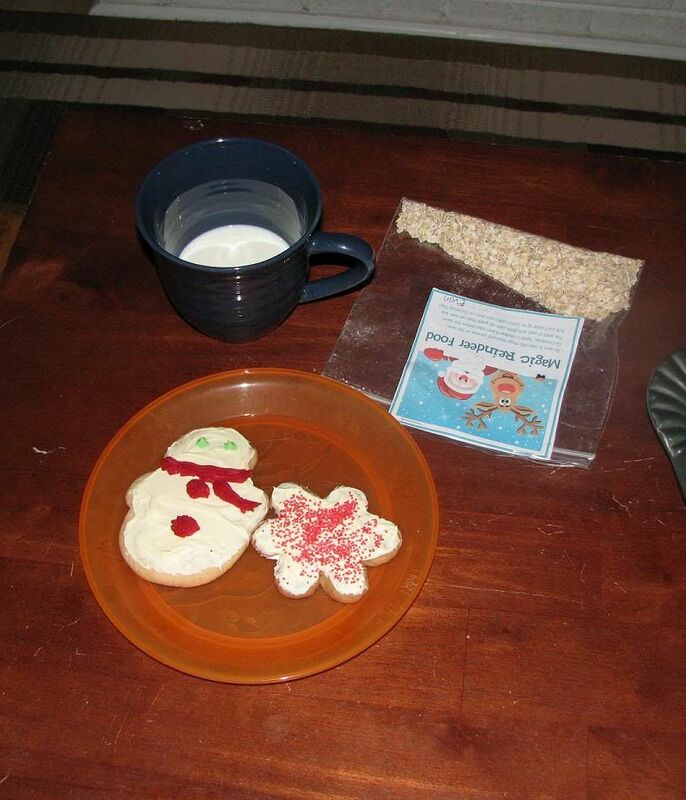 Next, we set out our milk and cookies for Santa and some special food for the reindeer. 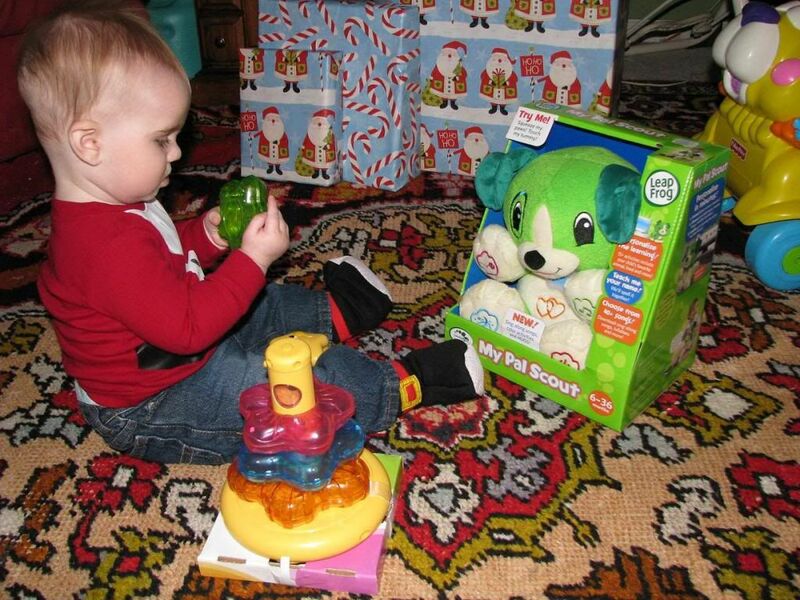 Santa arrived and made his delivery for Brody. 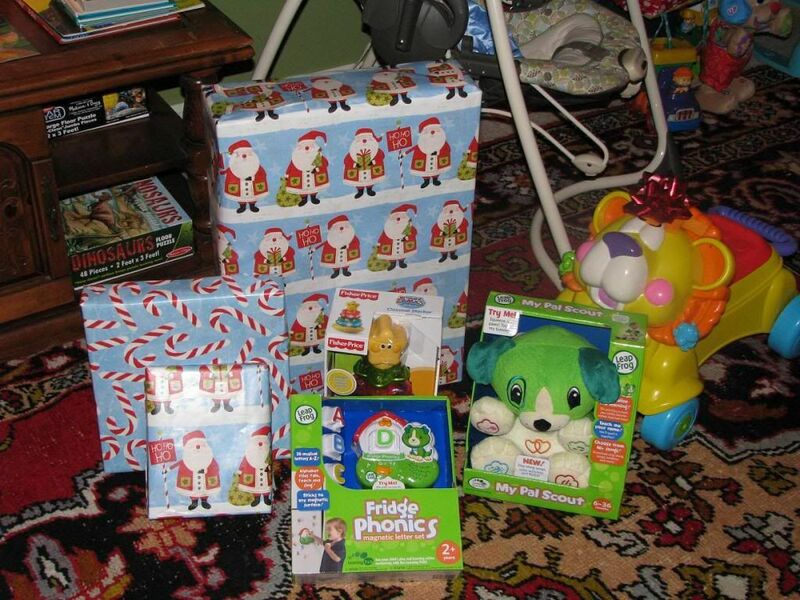 Evan's pile...his main gift was set up for him in the den with the television and all ready for him to play. 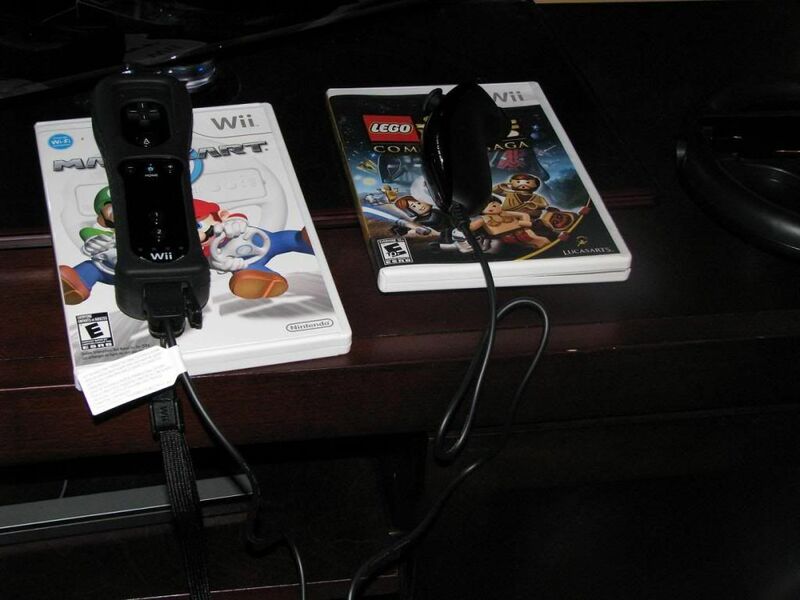 Yep, Evan got a Wii for Christmas and has been loving it. 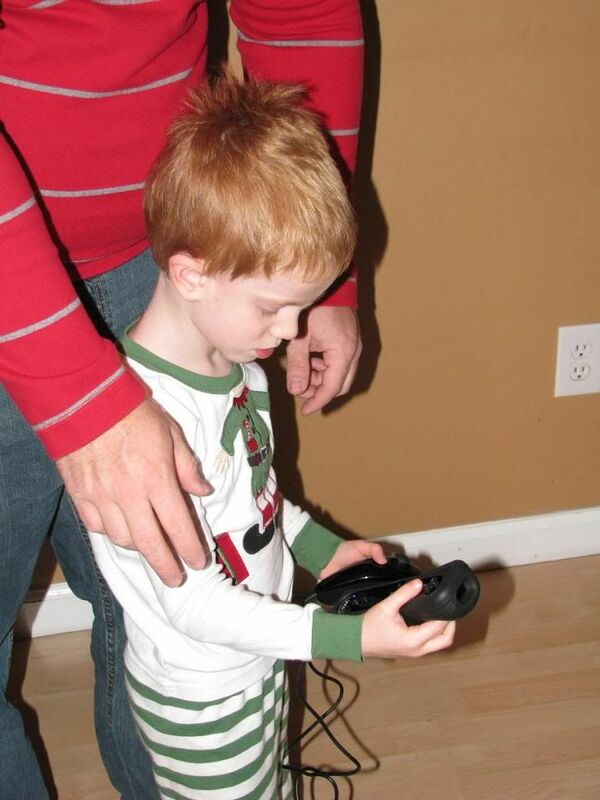 He had to have a Star Wars game, of course, and also loved Mario Kart. 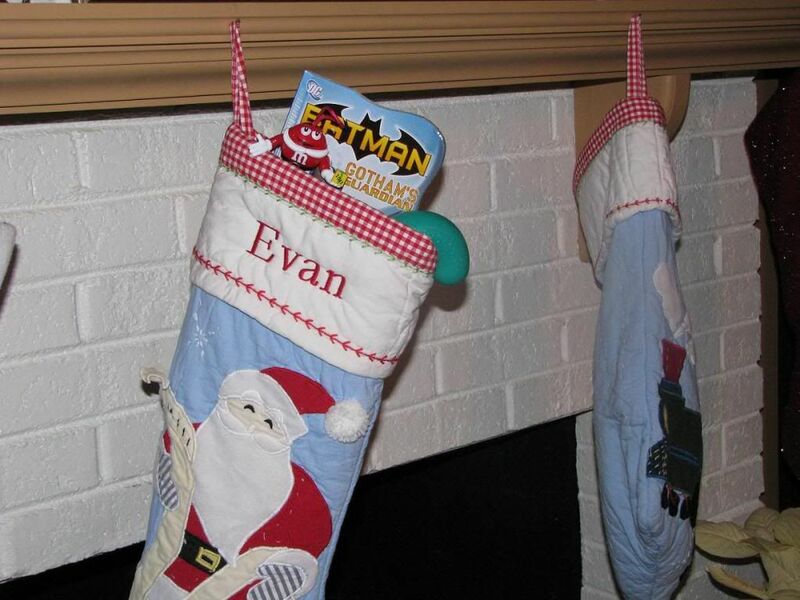 Evan's stocking looks more full than Brody's, but his stuff was just bigger. A letter from Santa addressed to the boys! 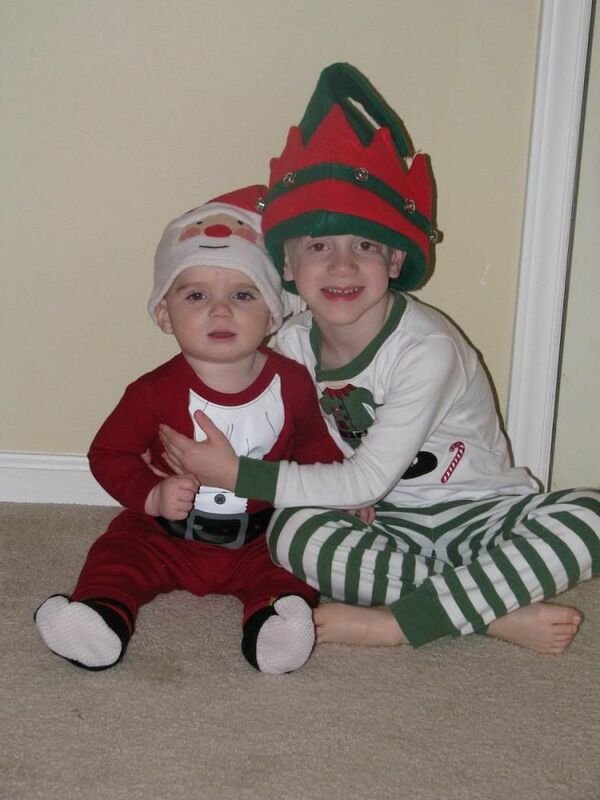 Little Santa and his elf couldn't wait to get downstairs on Christmas morning! 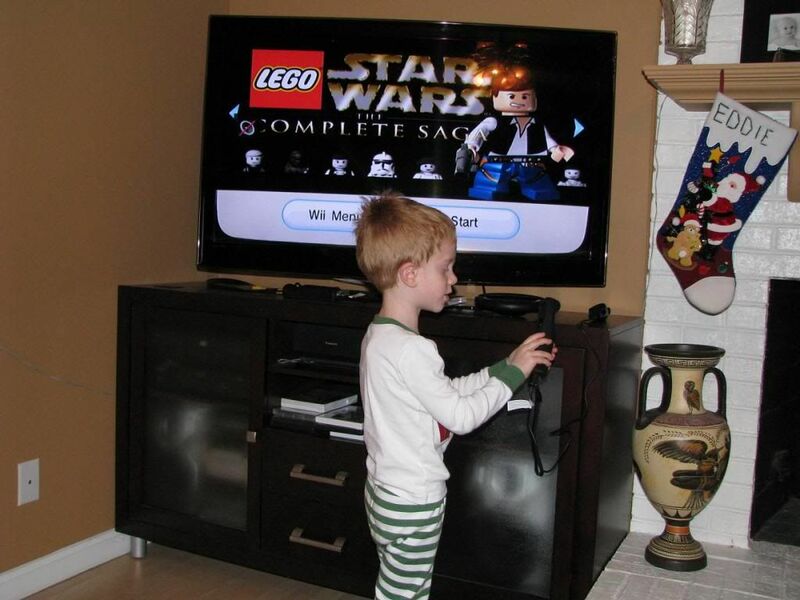 Evan finds his Wii when he hears the "Star Wars" music playing from his game. He had all the accessories hooked up and ready to play. 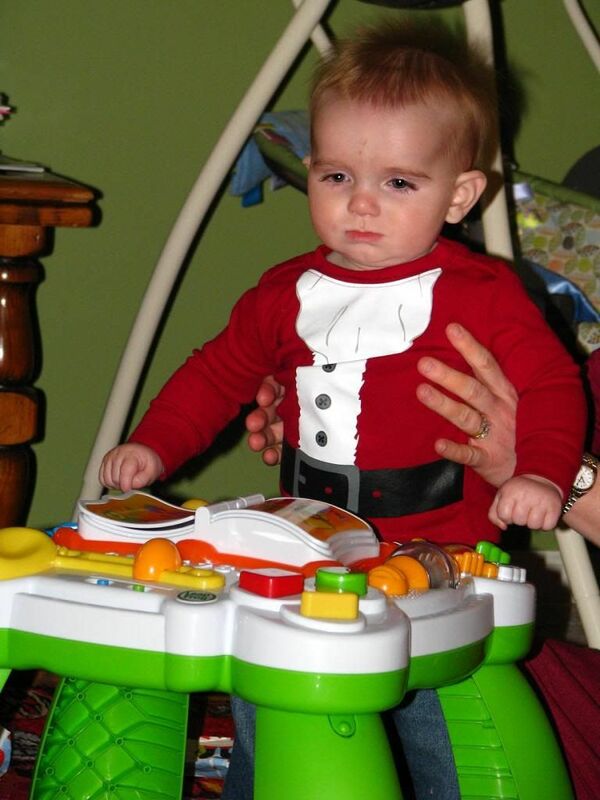 Santa must have some very tech savvy elves these days. 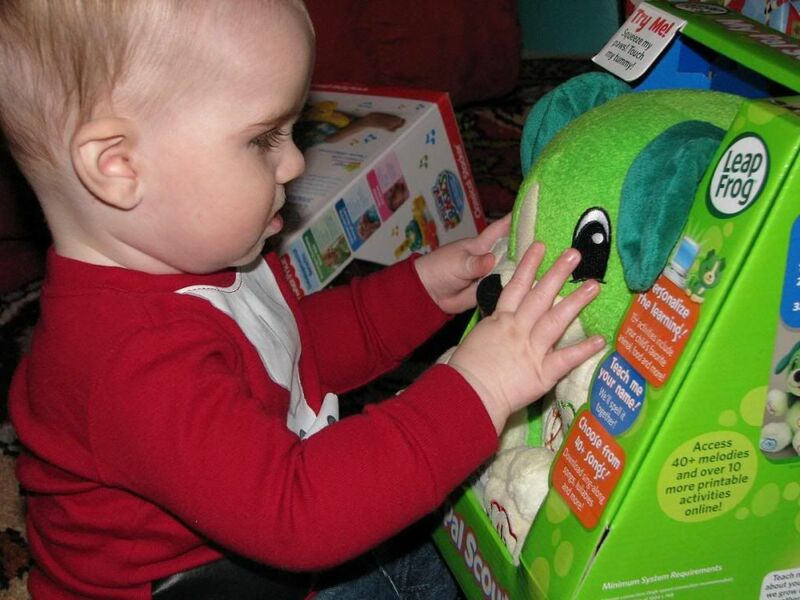 Brody got a lot of neat new toys, including a lot of Leapfrog toys that will help nurture his little mind. 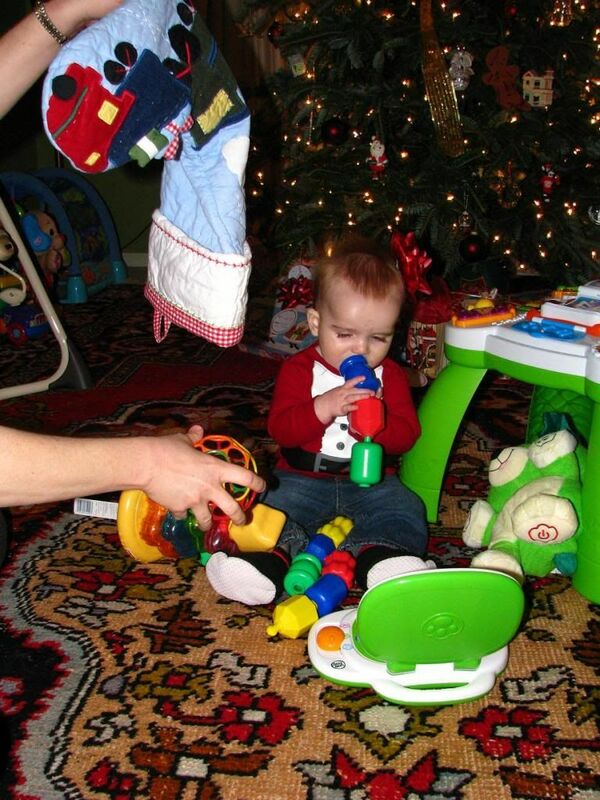 Checking out some of his toys while big brother is trying out his big present. 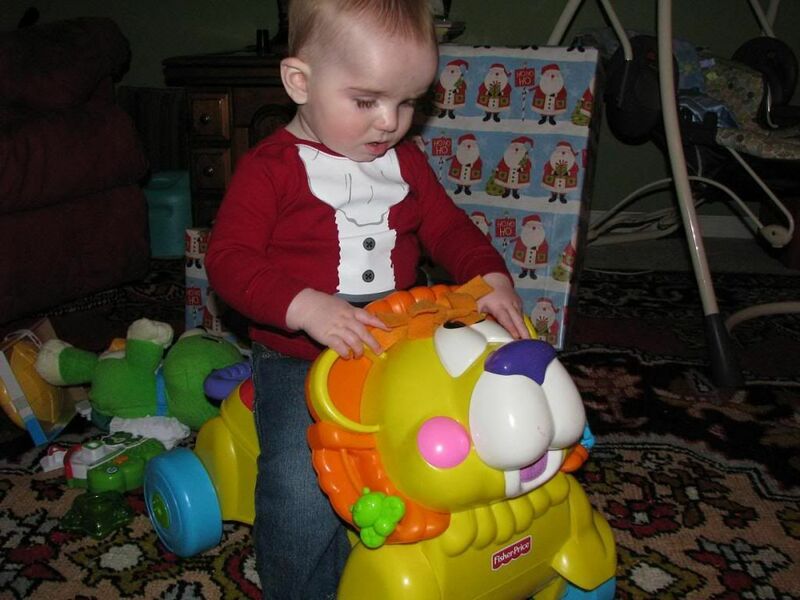 Big brother gave Brody his old lion walker/ride-on for Christmas. Brody loved it! Brody goes for his first ride. 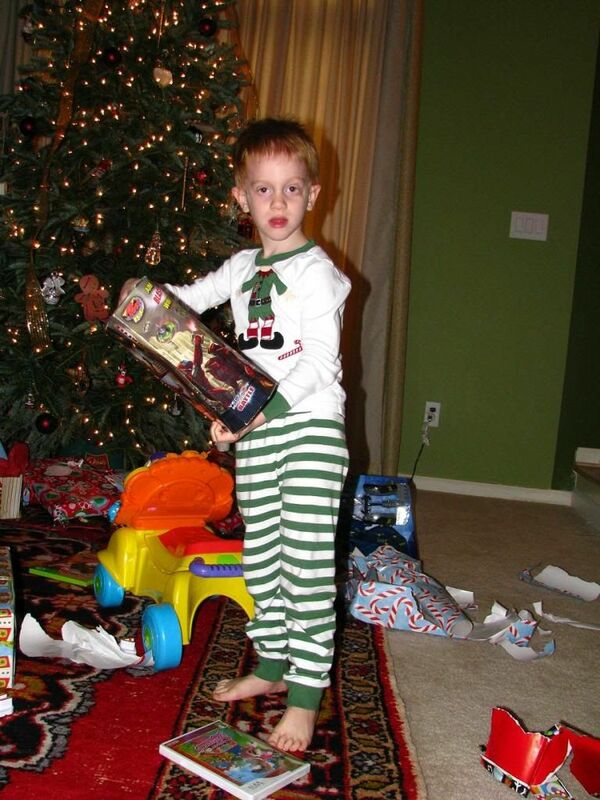 A big present for a little boy. Learning to rip the paper off. This was Brody's new play table. 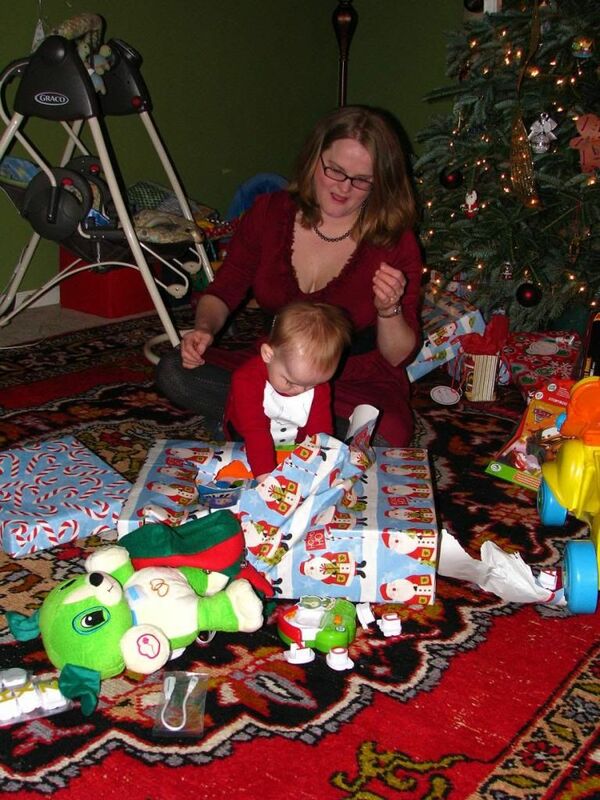 Evan unwraps a present too. 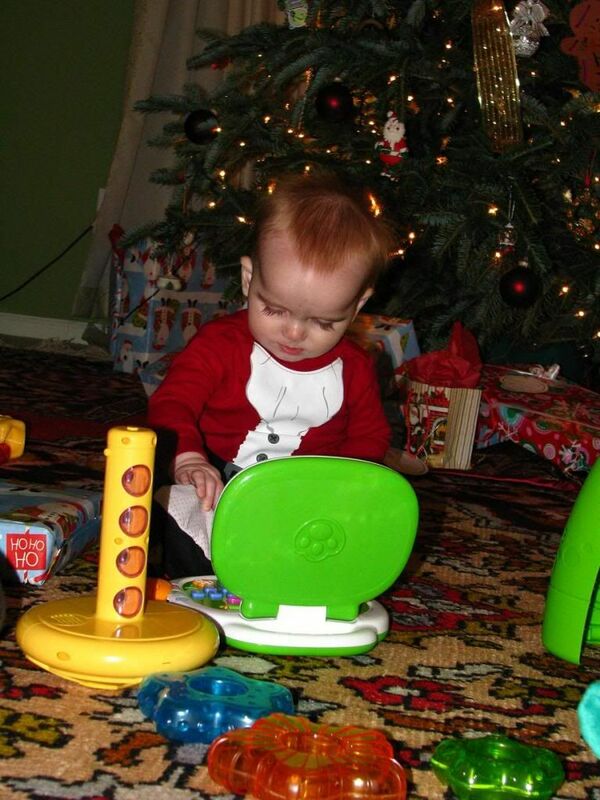 The cutest redheaded elf ever! 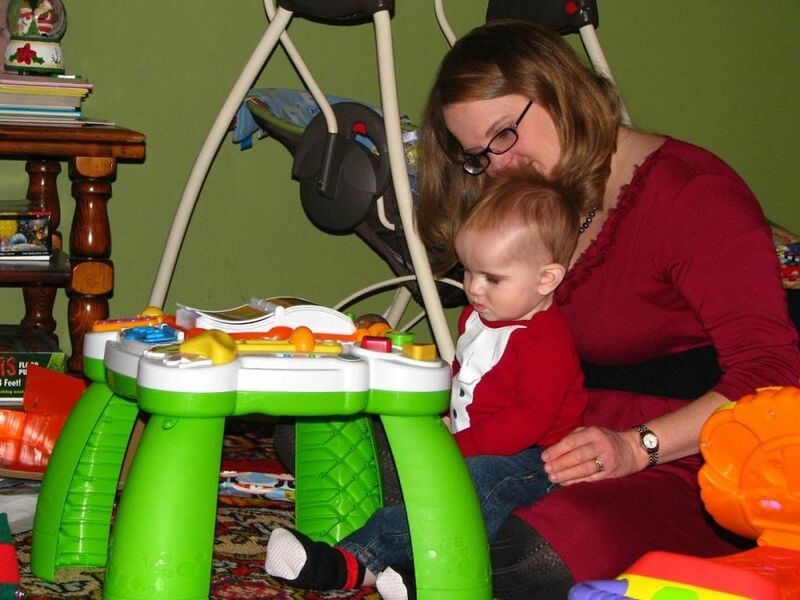 Mommy shows Brody his new table. 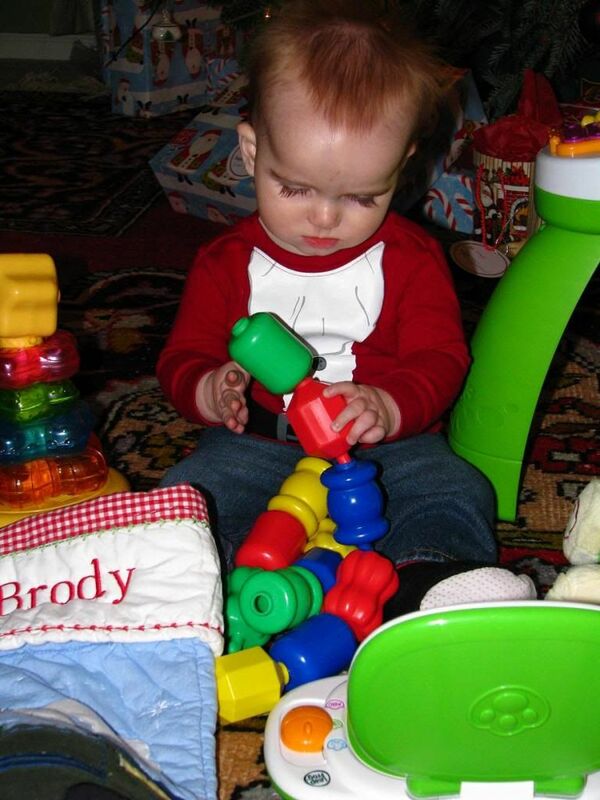 Brody did a good job standing at his table for a few minutes. 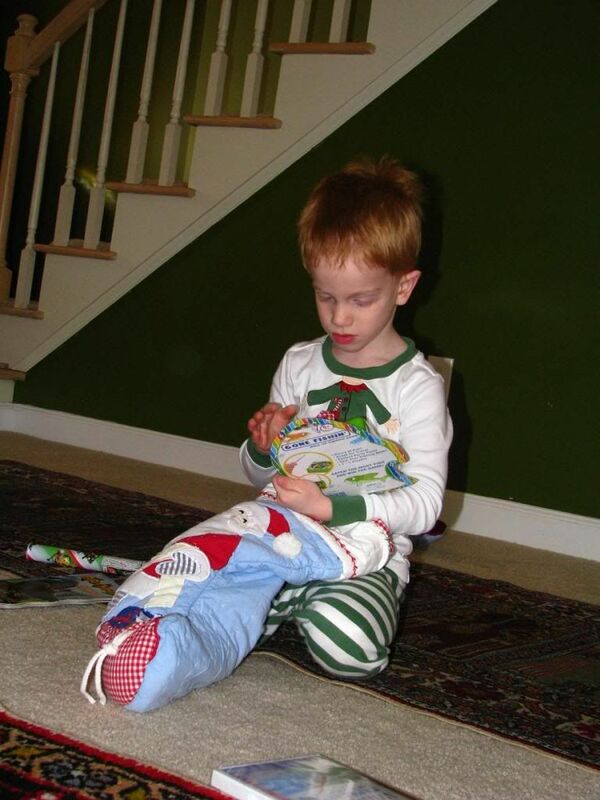 Evan checks out his stocking! Brody got his very own laptop! These cheap little snap together beads are always a classic. Brody had lots of treats in his stocking too. 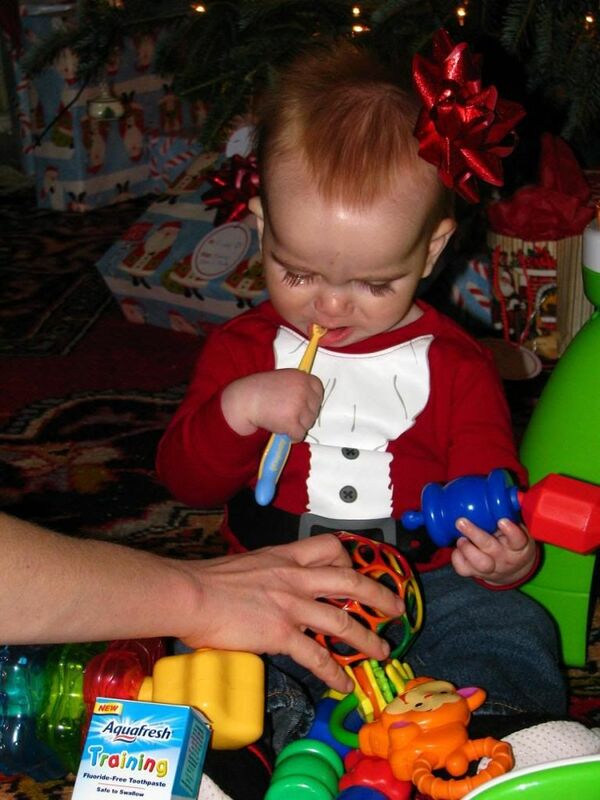 His new toothbrush was probably his favorite stocking find. 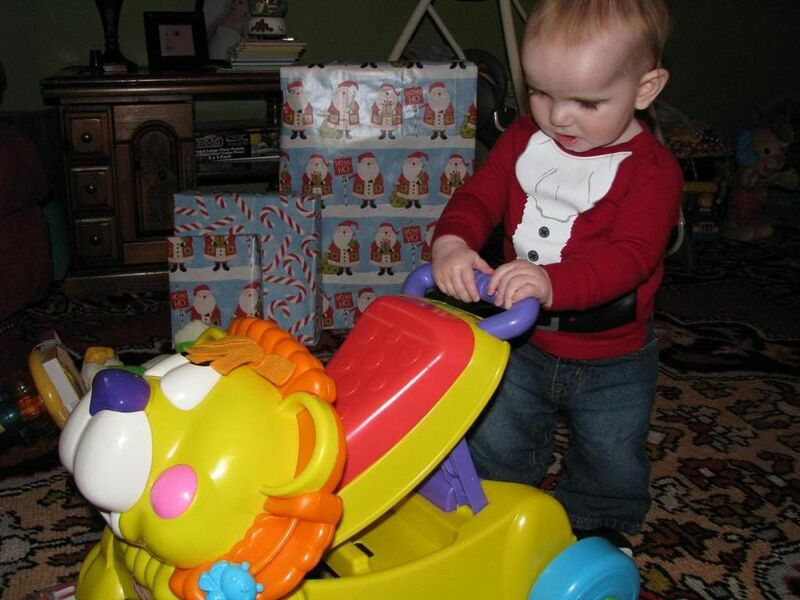 So funny that sometimes the cheapest little toy can bring so much joy. 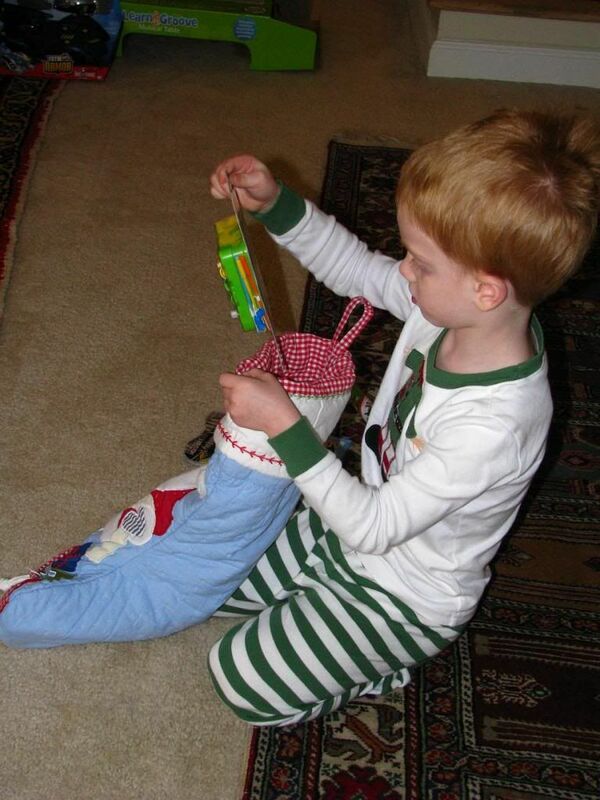 He loves his little "fishing" game from his stocking. 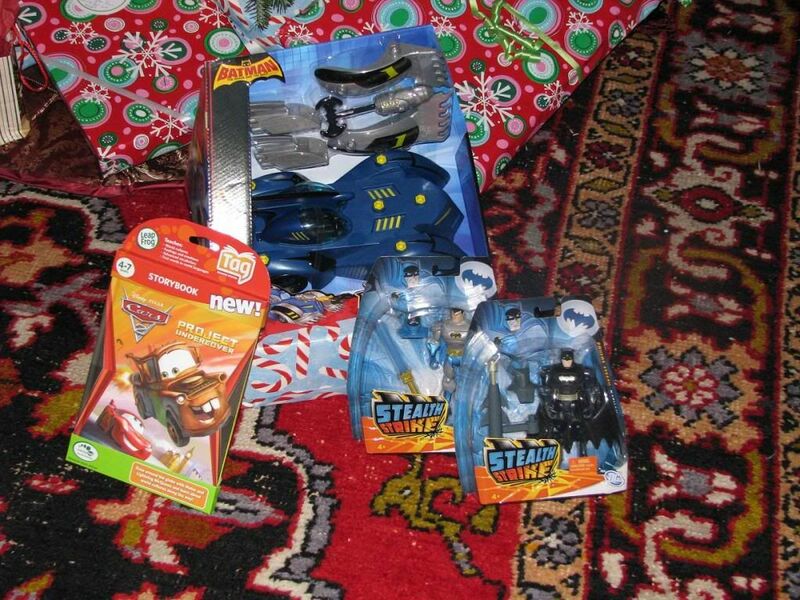 Brody racked up this year!